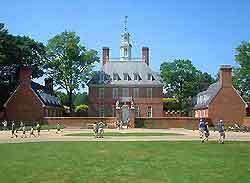 Home of colonial America and Virginia, Williamsburg is a major tourist city, with a host of sightseeing opportunities and entertainment. Williamsburg was first settled in the 1630s and is named after King William III. With ongoing renovations and restoration since the 1920s, Williamsburg's historic district is known as Colonial Williamsburg and features many notable sites and buildings. At the opposite end of the spectrum, Williamsburg also offers a number of major theme parks, such as Busch Gardens and Water Country USA, together with Williamsburg's impressive shopping centers and stunning golf courses. Hotels in Williamsburg are in good supply and suit all travelers, ranging from budget motels and camping grounds, to luxury hotels and apartments with city views. Accommodation in Williamsburg is particularly concentrated in the city center and along Richmond Road, Capitol Landing Road, York Street, Merrimac Trail, Francis Street and Longhill Road. 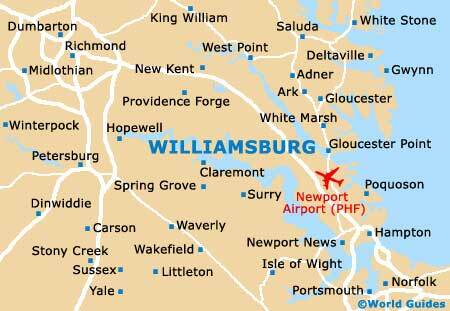 Further hotels can be found close to Newport News / Williamsburg International Airport (PHF), which lies to the east of the city. More information about Williamsburg Hotels. 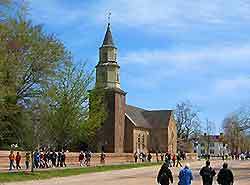 Tourism in Williamsburg is an important part of life in the city and the regiion's Colonial past is celebrated. The city's main tourist information center is the Williamsburg Area Convention and Visitor Bureau on North Boundary Street. Here you will find indepth tourism information about Williamsburg's main tourist attractions, public transport, restaurants, shopping centers and guided tours. Some of the main tourist areas in Williamsburg include Duke of Gloucester Street, Merchants Square and the charming streets around the Historic Area. Williamsburg offers numerous popular tourist attractions, including Busch Gardens Williamsburg - a major family attraction with thrilling roller coasters and over 50 other fast rides; Ghosts of Williamsburg Candlelight Tours - informative walking tours of Williamsburg's historic district; Water Country USA - the mid-Atlantic's biggest water park with many modern rides and a wave pool; Williamsburg Winery - a must for wine lovers in Williamsburg, offering regular wine tasting; and Capitol Building - a striking Williamsburg landmark, where many state legislators met in the 18th century. Other top tourist attractions in Williamsburg include the College of William and Mary - America's second oldest college, with many notable, elegant buildings; Williamsburg's Carter's Grove Plantation - an impressive mansion built in the 1750s, with detailed carvings and information about slave dwellings; Governor's Palace - a grand, opulent building, housing a superb collection of antiques, guns and period furniture; and a number of parklands and gardens, such as Williamsburg's Berkley Plantation, Kiwanis Municipal Park and Waller Mill Park. 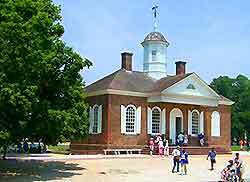 More information about Williamsburg Tourist Attractions and Williamsburg Landmarks. Some of Williamsburg's best museums and art galleries include Colonial Williamsburg - a spreading outdoor museum, celebrating the area's colonial heritage; Jamestown Settlement - a living history museum with many period recreations; Waterman's Museum - containing historic information and artifacts about the life of Chesapeake fishermen; Winthrop Rockefeller Archeological Museum - an underground museum, with a large collection of 17th-century Native American exhibits; Williamsburg's DeWitt Wallace Decorative Arts Museum - boasting a number of important art works from 1600 onwards; and the Muscarelle Museum of Art - featuring a fine collection of portraits and pottery. More information about Williamsburg Museums and Williamsburg Art Galleries. Tourist attractions standing near to Williamsburg include the Virginia Living Museum - a short drive from Williamsburg, featuring a wildlife park, a science museum and planetarium; Historic Jamestown - North America's first permanent English settlement, dating back around 400 years; North Bend Plantation - a national landmark dating back to 1801, to the west of Williamsburg on the James River; Westover - an important mansion constructed in 1735, with spacious, landscaped grounds and rose gardens, open throughout the year; and Yorktown Victory Center - the location where the Revolutionary War ended in the late 18th century, featuring a wealth of historic information and exhibits. More information about Williamsburg Attractions Nearby.